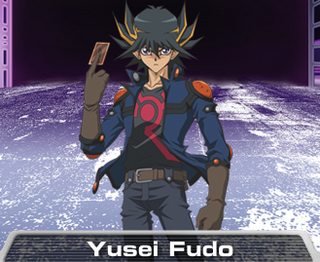 Yusei Fudo is a calm, quiet, technically savvy master mechanic and turbo duelist extraordinaire. Fueled with the hope of a better life for his friends, Yusei crafted the fastest and most competitive Duel Runner ever to kick it into overdrive! With pride in his ride and an unbreakable bond with his deck, Yusei is a gifted duelist who can throw down with the best of ’em. The main character, he plays a “Speed/Junk” deck focusing on summoning weaker monsters and Tuning them together to play more powerful Synchro monsters, most notably Junk Warrior, Nitro Warrior and Turbo Warrior. He lives in Satellite, the lower half of New Domino City. He is respected and admired by his friends for his genius style dueling, and his cool and clever personality. He tries denying his feelings for Akiza, only wanting to help her and be her friend, but shows protectiveness and affection towards her. 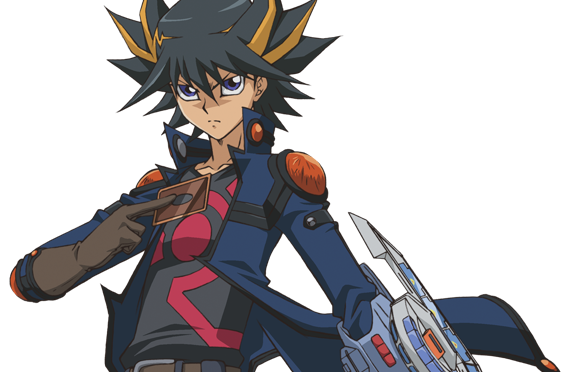 His first Duel Runner was stolen by his rival Jack, along with his signature card, Stardust Dragon. Two years later, with a new Duel Runner of his own creation, Yusei sets out to reclaim his Dragon. He was chosen as a Signer by the People of the Stars, and is marked by the Crimson Dragon’s Tail, which appears on his arm when he fights alongside Stardust Dragon, or encounters another Signer. His birthmark is changed to the Crimson Dragon’s Head, before he defeated Rex Goodwin in episode 64. His Dark Signer Enemy is his former friend Kalin Kessler whom he defeats in episode 55, as well as a former friend of his father, Roman Goodwin, whom he defeats in episode 57. Six months after the Dark Signers are defeated, Yusei, Crow, and Jack are preparing for the World Turbo Grand Prix. However, a new enemy known as Ghost appears. Yusei’s Deck uses many speed themed cards and revolves around the Synchro Summoning of the “Warrior” Synchro Monsters, mainly the Junk Warrior. Most of his non-Synchro Monsters are low in Level, giving him more fine control over which Synchro Monster he is able to summon at a given time. Also, each of his 6 Tuner monsters are Levels 1-5, while his 6 Synchro monsters are Levels 4-8. The majority of his monsters have special effects, usually involving reviving lower level monsters in order to Synchro Summon. In later episodes, he also has a lot of cards that support his Stardust Dragon. In his second duel against Kalin, the power of the Signers give him an additional Tuner monster, and the level 10 Synchro Monster, Majestic Star Dragon. In the non-canon Jump Festa Special, he has a card called ‘Assault Mode Activate’, which lets him upgrade his Stardust Dragon to Stardust Dragon/Assault Mode. Yusei uses 2 decks, one for Turbo Duels and one for normal Duels. His Turbo Duel Deck strongly focuses on Trap Cards to bypass the limitations Speed Spells contain. The majority of monsters in Yusei’s deck have low levels, emphasizing a major theme of Yugioh 5D’s: every card, no matter how weak, has a purpose. In the manga, his deck retains the Warriors theme, but, like Jaden Yuki’s manga deck, he uses a different set of monsters, such as Lightning Warrior and Mighty Warrior. When the situation calls for it, Yusei sometimes use cards from his allies. In his Lightning Deathmatch against Chief Armstrong, Yusei used a Deck made of cards given to him by inmates at the detention center. Many of the monsters in this Deck are outlaws or otherwise unsavory. He also temporarily used Tenzen Yanagi’s Treasure Deck, which featured ‘cursed’ relic monsters. He utilized this deck to its fullest to preach the same ‘every card has a use’ line, effectively using the curses against his opponent. Yusei’s duel disk is revealed to be hand made, with an intercom linked to the Duel Networks built into it. He uses this function to beat Sayer.